It was my MIL's Birthday on Wednesday. She is the most amazing lady that would do anything for anyone. I love her as much as my own Mum and if you've ever met her or get to meet her, you'll understand why. And she makes amazing cakes! I don't usually do bigger cards than A6 but this one I made for her is A5. I felt it needed to be extra special for a very special lady. Stamped with 'You are Loved' from the Spring Mini and the butterflies are die cut from the 'Beautiful Butterflies' Bigz Die. Although 'You are Loved' is a Valentine set it can be used for lots of different occasions which I've done many times. It's actually my most used set in the Mini without a doubt. I've even used it with last night's 'Simply Adorned' Class. I'll show you that next week. Wow..Jo what a beautiful card! Pink & crumbcake always work perfectly together & this is no exception, l love this, as l'm sure your mother in-law will too! 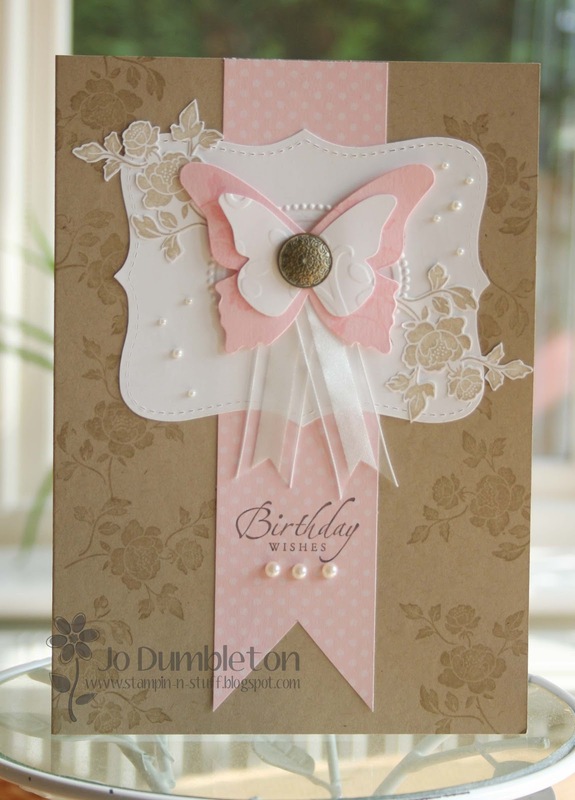 Stunning, a special card for a special lady!! this card is a total stunner, I'm sure your mother-in-law will be thriller with it! The card you made for your MIL is gorgeous! I love the colors, I would love to make a card like this! Have a sunnystamping day! Talk abt a round about way to find a stunning card....I foud this on FB on a Demo friend's Pintrest....and then followed the link!!! This is such a classy card. I love it. Is it Blush Bride or Pirou. Either way is is delightful and I am sure v v much appreciated. 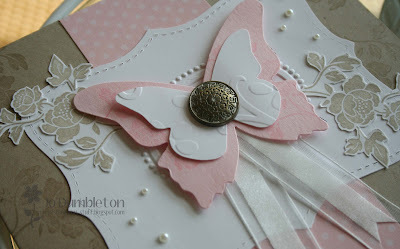 Just came across this beautiful card on Pinterest - totally, utterly gorgeous! Thanks for sharing and inspiring, I definitely feel a CASE coming on! Gorgeous Jo - love it! I love the colours on this card, pinned it on Pinterest last night. This morning, there were 10 likes and 72 repins!! Ι am not surе where you're getting your info, but great topic. I needs to spend some time learning more or understanding more. Thanks for great info I was looking for this info for my mission. website can be designed to offer either luxury or bargain-oriented goods, based on traffic analysis. astonishing fact that they are contradicted, and even outright disputed, in the greater SEO debate. deciding on who becomes the company's SEO. The growth management of small business can be accomplished with SEO as an integral part of your overall Internet marketing strategy. ' Every page should be optimized with additional keywords. good moves that can now get you into trouble. Online Advertising and SEO Marketing. a part of SEO services in Pune. This card is absolutely gorgeous! And THAT is truly an understatement. Thank you for the inspiration!